Welcome to the e-learning tutorial on Web 2.0 Fundraising. This tutorial will review four tools that are available for little or no cost. They are easy to use and provide ways to reach out to your extended network of supporters via the web. The four sites we will review today are: Causes on Facebook, Network for Good, AlumniFidelity, and FirstGiving. Each has slightly different features, but all can help you harness the power of the web to raise funds to support your organization’s mission and activities. 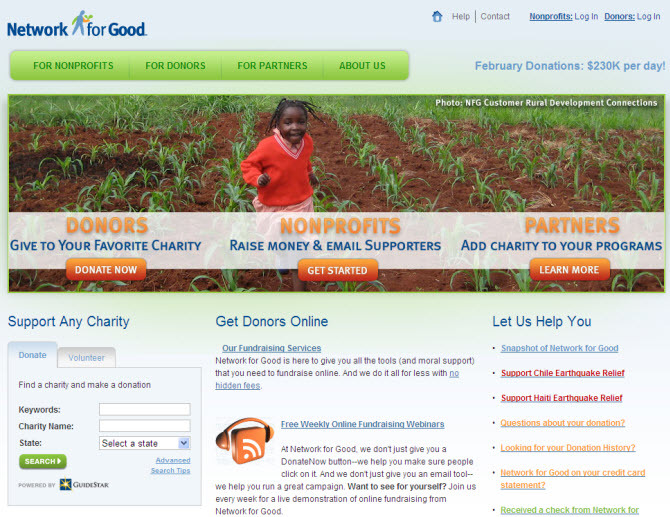 This tutorial will review four tools for online fundraising. This tutorial will give you a basic overview of four tools for online fundraising: Causes on Facebook, Network for Good, AlumniFidelity, and FirstGiving. Each offers its own advantages and disadvantages, but all can help you use the web to raise money for your organization’s mission and activities. The web allows your supporters to fundraise on your behalf. Using Web 2.0 tools can be a powerful way to raise funds. Supporters (both inside and outside of your organization) can raise money for you. They can make use of their personal networks and their belief in your organization to reach people with whom you otherwise may not have had contact. Facebook Causes are a great tool for quickly generating word of mouth about your organization. Because the average age of a Facebook user is 26, the site is a great way to reach young adults. It’s also great for spreading the word about your cause, but is less effective for raising funds. Facebook Causes are useful for spreading awareness and reaching young adults. Facebook’s "Causes" feature is a great way to get the word out about your organization. Facebook’s interface allows users to "like" or “become a fan” of your cause, which requires no commitment or monetary donation. It’s an easy way for people to simply show that they support what your group stands for. Facebook’s “News Feed” feature will also publish a line item noting that a user has become a fan of your cause. This will be visible to the user’s entire network of Facebook friends. You may find a ripple effect is created as more and more people learn about your group through their own connections. This viral quality also makes Facebook a useful tool for recruiting volunteers. Additionally, according to a 2008 Pew Internet Project survey, the average age of a Facebook user is 26, so the site is an appropriate forum if you’re looking to target young adults. Your Cause page features space for customizable messaging and a "Donate" button. You can create a Cause by first going to the Causes homepage at http://apps.facebook.com/causes/. Roll your mouse over “Find Causes” in the blue bar at the top and select “Start a Cause.” You can then enter your cause’s mission and designate an organization you’d like donations to go to. As long as your organization is a registered nonprofit with the IRS, you can receive donations through Facebook Causes. See the image above from an example of a Cause page. This particular cause is called “We Care Services for Children,” and its mission is to provide resources for children and families dealing with special needs. The page branding still carries Facebook’s logo, but a user can add his or her organization’s logo, photos, and a “Donate” button. The “About” tab offers a place for a user to post customized information about the cause. You can write an introduction that provides background on your cause and add a paragraph about your specific fundraising campaign. You can also add up to five short “positions,” which are succinct points of information about the cause (for example, location, mission statement, website, target audience, etc.). If you scroll down the page, you will see an area specifically devoted to fundraising, which shows the money you’ve raised so far. You also have the option to enter a fundraising goal that you want to meet by a certain date. Additional Cause page features include donor recognition lists and the option for supporters to post media or write messages. Under the "Members" tab, you will find a "hall of fame" that lists donors and their pledge amounts. This tab recognizes and ranks supporters in three unique categories: people who have donated the most money; people who have recruited the most members to the cause; and people who have recruited the most donors (new members who have joined the cause and subsequently pledged money). Your Cause’s "Home" tab shows the names of the top-five members in each of these categories. Farther down the page on the "Home" tab, you’ll see a section called "Recent Cause Activity," which displays updates on recent supporter donations. In this area, supporters also have the option to make comments to the group, or post a relevant photo, video, or web link. One supporter on the We Care Services for Children page posted a comment about his past experience as a volunteer for We Care and how it affected his life. Others have posted personal stories about their own family members with special needs and how the We Care organization has helped them. Report card: Facebook Causes are good for spreading the word, but are better for gathering support than collecting donations. Facebook Causes offers an easy, free way to publicize your organization using social marketing. Because Facebook users can “like” your cause without donating, Facebook Causes are more of a fan club than an effective donation-gathering tool. Any Facebook user can search for your Cause page, so it is not a private or secure site. (Donations made through your Cause page, however, are secure—meaning it’s safe to enter credit card data.) The site charges a fairly standard administrative fee of 4.75% of all donations received. Explore various Cause pages for yourself to discover additional features, donation and membership tracking tools, and ways to spread the word. You can search Causes by category, including “Arts & Culture,” “Education,” “Environment,” “Human Services,” and “Public Advocacy,” among others. Click here to begin: http://apps.facebook.com/causes/. Network for Good is a great choice for organizations that don’t want to commit a lot of time to managing a web fundraising tool. One of the site’s main offerings is a “charity badge,” or a widget that supporters can post elsewhere on the web. The badge links users back to a personal donation page and can be placed in emails, on blogs, or on other websites. Network for Good allows supporters to create a simple fundraising campaign. Network for Good is simple: there’s no organizational registration necessary, and a user can create a fundraising campaign in under 10 minutes. The site offers some basic tools that make fundraising easy. First, a "Donate Now" button can be placed on your page, which gives users one place to click to make a donation. An "Email Now" button offers an easy outreach tool for contacting supporters. The site also features a section called "Fundraising123," which has training and webinars to help you learn how to effectively raise money. Network for Good is also connected to GuideStar, a database of all registered nonprofits that draws info directly from the IRS. As long as your organization’s information is up to date with the IRS, supporters will be able to search for and find you on Network for Good and send donations directly to your group. Charity badges are customizable widgets that share information and collect donations. Charity badges are fundraising widgets that users can create on Network for Good. The badges share basic information about a cause using one image, 250 characters of text, and a video. Badges allow users to personalize their cause and explain why it’s important to them. For example, if someone wants to raise money for cancer research because they have been directly affected by the disease, they could post a picture of themselves or a loved one instead of a generic logo for a cancer research organization. People are 100 times more likely to donate to a cause when they know the person who’s asking them for a donation, and a personalized message can help boost those odds. Once you’ve created your badge by walking through the steps on Network for Good’s site, you can post it elsewhere on the web by using an HTML code. You can paste this code into emails, Evites (web invitations), MySpace pages, or anywhere else that accepts HTML. You’ll also be provided with a unique URL (a unique web address) for your badge. You can paste this link into emails, onto Facebook, etc. By clicking on it, users will be taken to a site that has only your charity badge on it. The badge also tracks donations and number of donors in real time. Report card: Network for Good is low-cost and easy to use, but limited in the tools it offers. Network for Good offers many features we haven’t touched on in this tutorial, so take some time to explore the site and see how it can work for your specific organization. Overall, Network for Good is low cost (it has only a 4.75% administrative fee, just as Facebook does), and the “Donate Now” button is free for your website. Charity widgets are easy for any user to create. The drawbacks: A user may feel limited by how much they can use the charity badge if they don’t have a website or blog on which to post it. Additionally, an organization is not able to monitor the progress of the campaign. FirstGiving offers simple tools for your supporters to set up online fundraising pages. The site features helpful tools such as resources and FAQs, reports on donation activity, and charts tracking funds raised. FirstGiving makes it easy for supporters to raise money. FirstGiving’s easy-to-use site walks users and nonprofits step-by-step through the process of setting up a fundraising page. As with Network for Good, FirstGiving is connected to GuideStar, which means that as long as your organization is a registered nonprofit with the IRS, supporters will automatically be able to find you on FirstGiving’s website. Once a supporter has decided they want to raise money for your cause, they will create an online fundraising page with your organization’s name and logo. Supporters can personalize their page with a photo, video, and text description about the organization or about their personal connection to it. If they have a Flickr account, they can link to it and display slideshows with additional photos. You can set a fundraising target and your page will show real-time updates on your progress. Your supporters can donate directly through your page, but FirstGiving also allows you to track and enter donations you’ve received offline, so your page reflects an accurate total of all the money you’ve collected. FirstGiving’s tools for sharing your page include badges, widgets, and a Facebook app. Anyone who visits a fundraising page, including the page’s creator, has the ability to share it with others. A person can click “Share this page” on the right-hand side and will then be presented with a handful of options for spreading the word. If you are simply viewing a page someone else has created, you can click an icon to share it on Twitter, Facebook, or via email. If you are the page creator, you have the option to use a fundraising widget. The widget gives a brief overview of your fundraising progress, your charity, and FirstGiving. You’ll get an HTML code to paste the widget on your personal blog or website. FirstGiving also offers options to publicize your cause on MySpace and Facebook. You can get a badge to post on MySpace that links to your FirstGiving fundraising page. 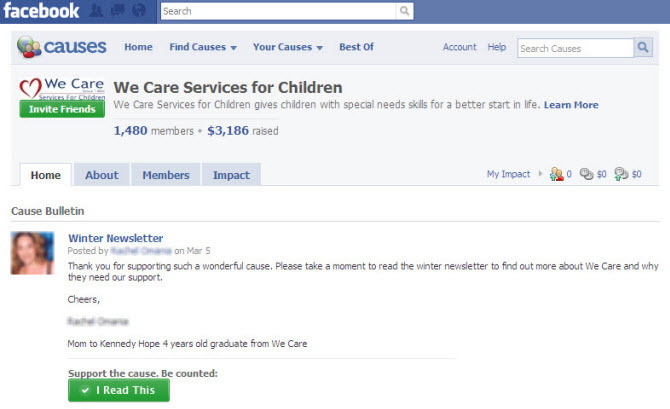 On Facebook, you can add a fundraising application that allows you to display your fundraising page on your profile. Nonprofits can also add badges directly to their organization’s website. FirstGiving offers lots of free resources and support. FirstGiving provides a lot of features for very low cost. While the 7.5% administrative fee on all donations is higher than some of the other sites reviewed here, you get a lot for your money, including donor reports, free phone and email support, and unlimited person-to-person fundraising pages. While FirstGiving doesn’t manage the appeal process as extensively as AlumniFidelity, it will send automatic, customizable thank-you emails to donors. The only real downside of FirstGiving is that to access its full offerings, your organization will need to pay a $300 annual fee. This fee pays for your nonprofit’s branding on all your pages, event registration capabilities, and team fundraising capabilities. Explore FirstGiving by clicking here: http://www.firstgiving.com/. Each Web 2.0 fundraising tool offers different advantages for spreading the word and soliciting donations online. Before selecting one or more of them for your organization to use, it’s important to think about which one offers the features that will best meet your needs. You’ll also want to talk to your staff and volunteers and designate people to manage your online fundraising efforts. Using an action plan can help you get organized and move forward efficiently. Before implementing any tool, you’ll need to identify and understand the needs of the people who will use it, such as your organization’s volunteers or partners. Consider whether consultants, clients, or even your board of directors will be impacted by your decision to use a web fundraising tool. These people are your key stakeholders. Because the fundraising tools reviewed here are all free for basic usage (aside from small administrative fees charged on donations received), the decision to use one or more of them isn’t likely to have a major financial impact on your organization. However, consider the amount of time it may take to set up and administer your fundraising page. If you choose to use a more complex site, you’ll have to invest staff time for training and ongoing maintenance. Review the comparison tables that provide guidance on time required for each tool. Consider your organization’s needs when selecting a web fundraising tool. Do you want to increase word of mouth about your cause, is your focus simply on raising money, or are you seeking a combination? The site with the most features isn’t necessarily the best fit for your cause. Let your needs drive your decision. These are all elements of change management for adjusting to using a new program. Once your organization has selected and begun using a web fundraising tool, you’ll want to evaluate its effectiveness. Most of the tools reviewed here track visitors to your fundraising site and you’ll also have data on donations you are receiving. Talking to your staff and volunteers and gathering their opinions on the tool will help you gauge how useful and meaningful it is to your organization. These web fundraising sites do not require major investments of money or time, so the decision to use one (or more) of them may not impact your organization the way a large software purchase might. Still, it’s a good idea to make sure your staff understands the value added by web fundraising tools. An action plan can help you organize your thoughts on paper. Include your web fundraising goals, a list of identified stakeholders, and steps for moving forward. To begin creating your action plan, download the action plan template. Thank you for taking the time to view this tutorial on Web 2.0 Fundraising Tools. Remember, these tools are all available at little or no cost. They all offer unique options for reaching an extended network of supporters and donors. If you communicate with your staff and volunteers and take the time to research which tool is best for you, you can make the most of Web 2.0 fundraising opportunities. These resources will help you raise funds over the internet. Thank you for taking the time to watch this tutorial. All of the fundraising tools reviewed here were selected because they are either low- or no-cost, web-based, require no programming or advanced technical skill, and fit the needs of many nonprofits. Causes on Facebook: Good for spreading the word, but better for gathering support than collecting donations. Network for Good: Low-cost and easy to use, but more limited in the tools it offers. AlumniFidelity: Has higher fees and takes longer to set up, but offers great customization. FirstGiving: Offers lots of free resources and support, but the customizable fundraising pages have the highest cost of all the tools.